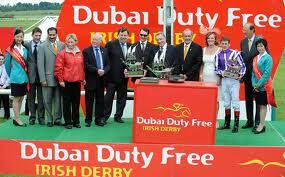 The Irish Derby is the second race in Ireland’s Triple Crown of Thoroughbred racing. It is considered the equivalent of England’s Epsom Derby and is held three weeks after the English race each year, which usually puts it in late June or early July. The race is run on turf at the Curragh Racecourse in Ireland and has a distance of 1 mile and 4 furlongs. There is €1,250,000 up for grabs at the Irish Derby with €725,000 going to the winner! The Irish Derby is huge betting event in Ireland and you can always find some great promotions on the race with Irish or UK bookies. We recommend betting on the Irish Derby at Bet365.com, one of the most well known and respected sportsbooks online. Bet365 offers some great general horse racing promotions such as guaranteeing the best odds and offering a free bet if you back a winner at 4/1 odds or greater. They also add some great promos just for the Irish Derby, so they are a great bookie for betting on this race. Read the full Bet365.com racebook review here. If you reside in the United States then you are out of luck when it comes to Bet365.com. I suggest trying out Bovada.lv to bet on the Irish Derby. To bet on this race you will first need to open a Bet365 account. Click here to visit Bet365.com, then proceed to click on ‘Join Now’ in the top right corner under the login fields. Fill out the quick form, do not enter a bonus code, and you will be set up for an account. Next you will have to fund your account in order to have money with which to bet on the race. Log into your account, then click on ‘Deposit’ in the top right corner. Choose any of the deposit methods and keep in mind that because you signed up through a link found here at Bet On Horse Races your first deposit will be matched dollar for dollar up to $200, so I suggest you take advantage of this bonus. Now that you have money online you are ready to bet on the Irish Derby. Click on ‘Horse Racing’ from the left sidebar at Bet365, find the race and place your bets. You can also scroll down to find the Antepost bets which will allow you to bet on the Irish Derby at Bet365 many days in advance. The Irish Derby was first established in 1817 and was originally called the O’Darby Stakes. This race only lasted until 1824 before it was shut down. The Curragh Derby was the next “Irish Derby” and it was established in 1848, but it too shut down after only a few years. It wasn’t until 1866 that the modern Irish Derby was created. The inaugural race was run over 1 mile, 6 furlongs and 3 yards, but it was eventually cut to it’s current distance in 1872. It wasn’t until 1962 that the Irish Derby really took off as a major international race and this was mainly because the prize money increased substantially. The Irish Hospitals’ Sweepstake race was combined with the Irish Derby and it became the Irish Sweeps Derby with a large prize pool that began to consistently attract the best horses in Ireland and the UK.